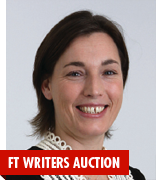 For anyone looking to get their New Year finances in order, why not bid to have lunch with MoneyWeek Editor-in-Chief and consumer finance expert Merryn Somerset Webb at a restaurant chosen by the FT’s Restaurant critic Nicholas Lander? Merryn is happy to include more than one in a lunch if you’d like to bring a needy friend, and are willing to pay more for the privilege. All funds raised will be donated to The Global Fund for Children. For more details, please go to: http://www.ebay.co.uk/itm/160931974532. We can’t think of a wiser or more fun lunch companion!